When he put the mallet down he was panting. His whole body pulsed with each breath cut short by the mine dust that had built up in his lungs. The pain meant nothing. He tested his work, gripping the base, the first of three wooden components. It was shaped like a window frame, except there was a gap on the left side, leaving the square incomplete. A wheel was attached to the top right end, which when spun controlled the mechanisms that made his invention work, and a handle was attached to the top so that it could be lifted. Montague’s wheezing slowed to a sigh. His fingertips ran along every inch of it, the fine precise holes and grooves he had drilled to insert the unique mechanism, and the corners he had spent days smoothing down… which had in turn rewarded him with splinters so embedded they had become a part of his hands. Now one more attachment was left, the most fragile component. Even with the risk that it might finish him, he would have to use magic… Over the years he had developed his own brand, some Bantu mysticism he had learnt in the Homeland, long before he and his countrymen were taken, mixed with French alchemy which he had imbibed from his second master. Not so long ago, Ekari Mbvundula (the ‘b’ is silent, and the emphasized syllable is DU) was surprised to learn that her story “Montague’s Last” was not only going to appear in Omenana, but reprinted with an audio version here at Strange Horizons (who had asked Chinelo Onwualu, the editor of Omenana, to select a story for reprint.) So Ekari is one of the growing numbers of African SFF writers like Wole Talabi or Tade Thompson who are published in Western venues. The story is a kind of alternative history set in the 18th Century. To avoid spoilers, all I can say is that one small piece of magic helps an incarcerated black slave to play a role in the industrial revolution. While in Malawi, I gave a small seminar to Shadreck’s story group, and was impressed how cheerfully the women writers bantered with the young males, sometimes gleefully exposing their attitudes. One young man said Malawian men were getting more comfortable with the idea of women who were earning more than they were – and offered himself and his girlfriend as an example. ‘And are you still together?’ Ekari asked him. Great hilarity when the young man admitted, ‘She’s my ex.’ I had assumed that Ekari was something of a feminist. Ekari: “It was more a discussion of the dating rituals and norms between the sexes than it was about feminism. A ton of fun challenging them though hahahaha! What I was getting at was in the vast majority, women who earn more than their partners might feel a little bitter about supporting a man they were conditioned to believe would be their knight in shining armor. “About feminism... I could get deep into it, but long story short, my perception of feminism the concept, as discussed on mainly western social media, and feminism day to day, is continually evolving. Personally, I think I am as privileged as a black African woman who grew up in Africa could be. For me to complain about sexism keeping me down would be an insult to impoverished women and girls who have their autonomy intentionally removed. Ekari holds down a demanding job, working for the country’s electricity provider, “I’m working as a risk management officer, going to every department and getting them to assess what might go wrong, and how to improve things. “I used to claim the victim role, since feminism says that as a woman of colour I am automatically oppressed. But I don't anymore. Things aren't always black and white, and privilege doesn't always fall neatly between gender or race lines. I think a more nuanced examination of privilege would be across socioeconomic lines, because that is what this world really values – people's monetary worth. “It is true that that wealth is more often than not distributed on the white male side than the woman of colour side, and everyone else falls in the middle. But it is never universal. White men can be poor. Black women can be rich. And most of the time, the determinant is how privileged their individual upbringing is. So we can't make blanket statements or create policies based on who is privileged and who is not, purely by judging physical features. If you want to help the most underprivileged people, yes, they will mainly tend to be people of colour. But that doesn't mean you turn away all white poor people on principle. That goes with gender too. “I grew up in Lilongwe and went to Bishop Mackenzie Primary School which had a program with Macmillan. Book catalogues would come. A real effort had been made to make them attractive, with glossy illustrations. You could order the books, your parents would pay and a few weeks later the books would come in. It was like Christmas. “I would go for the most colourful, fantastical-looking books with twisty dragons and magic, stories about the oddball kid who was not just different but important. I was a shy kid growing up, and with books I could get lost in another world. “I read a lot of Enid Blyton. The Magic Faraway Tree really stood out. You climb a tree and it takes you to other worlds. Here in Malawi we have the baobab tree and it’s big enough that you can believe you can access other countries. I read A Wrinkle in Time, and then Philip Pullman which gave me a sense of wonder. From there it was Lord of the Rings, Harry Potter and tons of fantasy. I wanted to create a sense of wonder for other readers. Later, Ekari went to Kamuzu Academy, a school founded by Kamuzu Banda. Not only did it have a library full of books but the library itself was an architectural wonder, very different from most buildings and the library itself evoked a sense of wonder. Like many young Malawians, Ekari looked to competitions in order to get publication or validation. She had started to write for friends at age 14, but her first short story written as an adult was called “The Elephant in the Room”. It was a fantasy, submitted to a university writing competition. “The prompt was ‘elephant in the room’ so I made it literal.” The story is still available on her blog. Ekari went on to study at the University of Cape Town. Ekari: “South Africa a fascinating place – post-apartheid and all that. We define as post anything that is still part of your identity. I feel like some things there are still apartheid flavoured. I was there at the time of xenophobia and was affected by it. The stuff that makes the news is the violence, but I also noticed it going on in things like work permits. Things started changing, it seemed with the aim to cut out illegals; things that were there not just to regulate but to stop. You heard of foreign doctors not being able to get a permit. “One South African minister called xenophobia the Billion Rand Mistake. It made it too hard for people who wanted to invest to come in. “‘On a personal level the group that was hardest to befriend were black South Africans. I was really shocked – it was so much easier with other expats. The black South Africans don’t really get along with each other, the Zulu vs. Xhosa thing. You come in as a foreigner, come to a party and someone will speak to you – and then ignore you if you don’t speak their language. “I went with a black South African friend to a Zimbabwean friend’s birthday and she saw Indians there. She had a look of pure fear. She looked at those people as you would at a lion. She kept saying, ‘I can’t go in there, I don’t know those people.’ That said more to me about apartheid than anything else. It made you fear every other group than your own. Earlier this year, Ekari was part of an online reality show competition based in Nigeria. Called The Writer 2016, it started with 12 writers, each having to write a short story a week. Each week three writers would get eliminated. Ekari’s stories for the competition are online on The Naked Convos website. She’s currently working on a novel based on some of her work in the Imagine Africa 500 workshops. I asked her to sum up. 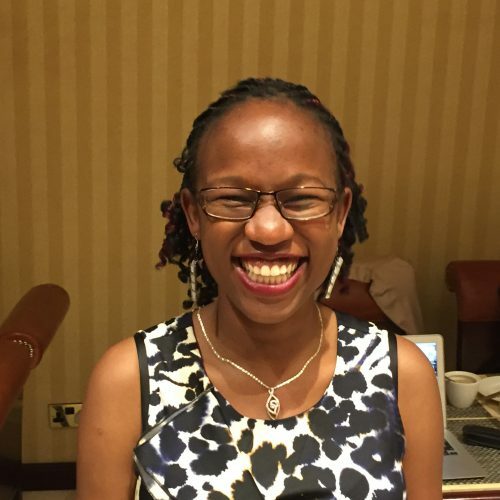 Ekari: “The main challenge for African SFF is to get readers. I know the market in the West is open to us, but closer to the heart are local readers. Average literacy is a problem, but the main difficulty is that literature has not endeared itself. There is little reading culture in Malawi. We are watching stuff online, we are reading Western books, we’ve all read or heard about Harry Potter, people want to be excited by compelling characters. Stories are a huge part of Malawian culture, our dialog with our selves. It’s time we prove it. “I really hope that the more we young writers write, the more will we engage other young people. That’s what I hope – that our techno-crazed culture will have a popular fiction with a context that reflects our own identities." 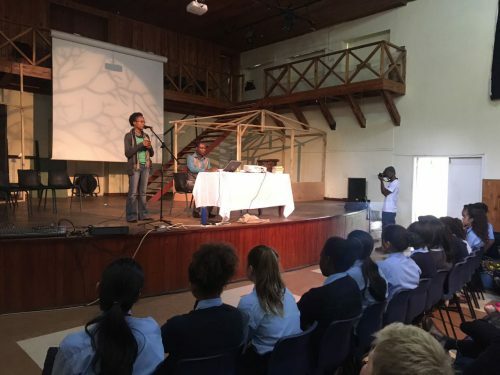 Ekari in action in March 2017, speaking about being a writer to schoolchildren in the city of Blantyre.